From 1851 to 1862 the family was lived and worked at Weston Farm, Whitton, Shropshire, England. Rural living was unrewarding and then, with farm mechanisation, families were being forced off the land into squalid conditions in the cities in the hope of finding employment. 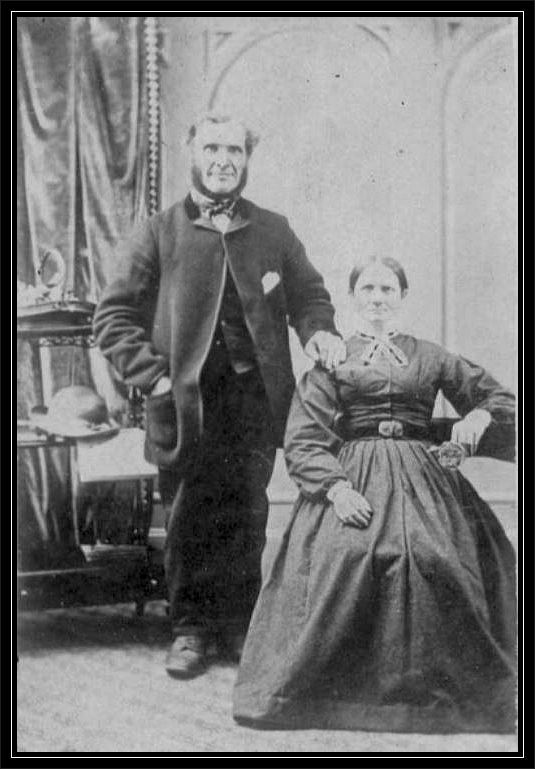 The promise of a new life in the Colonies saw William, now age 36, and Mary leave all they had known and depart from London aboard the "Huntress" to immigrate to Timaru New Zealand 16th Dec 1862. The Huntress faced with foul weather, was forced bypass it's destination of Timaru despite being in sight of the shore so our Benbow pioneers made their first landfall at Lyttelton arriving on the 21st Apr 1863. The harbour at Timaru was still undeveloped and not an easy port to get into. Ships at this time were forced to anchor well out in the roadstead and then small boats from the landing service brought the passengers and cargo including animals, ashore and the Captain decided against the risk. There was a reasonable efficient landing service because local runholders had to get their wool shipped for export - transport overland was not a viable option before bridges were built over the rivers. At Lyttelton, housed at the Immigration barracks days passed while they waited for their belongings to be unloaded and they then could take a coastal steamboat south and be landed by surfboats on a coast quite unlike the beach of today. Newly arrived immigrants found work was plentiful, either on the well-established sheep stations or in the growing township. However the shortage of labour was unfortunately matched by a shortage of accommodation, so often halls and public rooms were taken over as a matter of necessity. Most ‘‘new chums’’ had work immediately at wages of £25 to £35 a year, which was considered good. 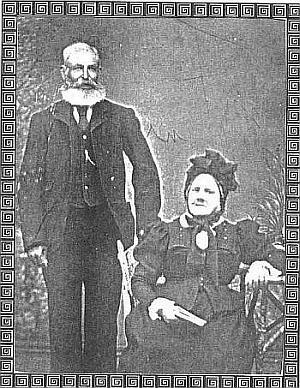 The Benbow family spent their first night in Timaru and left the following day by bullock wagon. A team of bullocks pulling a dray could average about 15 km per day on the dirt road and they were able to make a stopover by nightfall at the Arowhenua Inn at the river crossing. The proprietor Mr Young pointed out the best crossing route and he also operated a passenger ferry. Temuka is believed to have come into existence because of its proximity to this ford on the Temuka and Opihi Rivers and was the only crossing place on the main north-south route at this time. Almost all the forest in the Canterbury province had been cleared by Polynesian burning and only the Arowhenua Bush remained but the spring of 1859 was particularly dry throughout the South Island eastern districts and in October a fire swept through the Arowhenua Bush in South Canterbury destroying, among other things, £2,000 worth of sawn timber. Fires broke out everywhere, many thought to have been caused by sparks from bushworkers' billies. Just a few months before the Benbows arrived in January 1863, another accidental burn completed the devastation of the Arowhenua Bush, taking with it sawn timber, fencing and houses and settlers were lucky to escape with their lives. 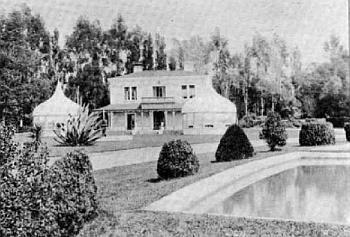 The land would have appeared very desolate to newcomers eyes as they arrived at Temuka where William was to work for John Hayhurst as their gardener and Mary as his housekeeper. In March 1864, son William Charles was born at Georgetown. How elated the family must have been when William took possession on August 1864, of 20 acres on the south bank of Temuka in the Geraldine district - the promised land had lived up to expectation after less than a years work. Until their home was built they were given shelter at a neighbouring farm. The sod hut made of straw and mud bricks was given an iron roof instead of the more usual thatch which accounts for why it remains today. The family moved in before there were doors were fitted and with the shortage of glass, windows had wire mesh until some was available. The children walked 6 miles to a private school at Arowhenua over bullock tracks and waded a couple of creeks. Two more babies, Mary Caroline in 1866 and Lucy Harriet, 1868 were born and busy years were spent clearing the land, a priority was fencing and stocking with animals - pigs, a cow and essential Clydesdale horses. Children were busy helping clear stones from paddocks preparing for sowing the crops. Timaru Herald, 3 Aug 1867: GERALDINE ROAD BOARD: Received an application from Mr Benbow, asking permission to take sods from the road opposite Mr Dyson's for a ditch and bank fence. With open grassland and timber being expensive William and other farmers built ditch-and-bank fences. This was common in parts of the British Isles. These were a ditch about 3 ft deep and 5 ft at top narrowing to 1ft a the bottom and with the bank of piled soil, a 6 ft high barrier was formed to which gorse or not only did their roots hold the bank but hedging added height. Garden seeds germinated, and cuttings and fruit stones raised enough trees to replant again and from the Benbow orchard, one of the first in the Rangitira Valley, plants were sold as far away as Rangiora and Christchurch. Mary's precious bulbs - her favourite, tulips in 6 shades, multiplied and Mary went by horse and trap to Timaru to sell her flowers to a florist. 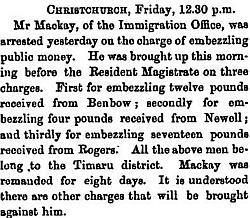 Timaru Court, 25 Sep 1869: As an assisted immigrant, William was paying back the passage money by instalments. It was collected by an immigration officer who had then to pass it on to Frederick LeCren, a Timaru Merchant who was acting as agent for the Government. Except for £1, the money paid by Benbow, Newell and Rogers failed to eventuate. The officer was imprisoned and at the court trial that followed, William Benbow gave evidence that he owed the Government £23 and he had given the officer £12 on account and had received a receipt. The others gave similar evidence outlining their situation and each produced receipts backing this up - the officer was found guilty of embezzlement. Timber cut from the old Arowhenua Bush was used to erect St Saviour's church 1869, and the foundation stone was laid by Mr William Hornbrook. The opening service was conducted early in 1870 by the Rev. W. H. Cooper and was the Benbow family's place of worship and for many years William served on the vestry. It was burnt down November 1897. Timaru Herald, 9 Aug 1872, Roads Board: Messrs W. Benbow and J. Downs applied for small repairs to be made to the road near their residences and this was agreed to. Timaru Herald, 19 Mar 1875: TEMUKA AND GERALDINE A & P SHOW. DAIRY PRODUCE. For the best 3 lbs fresh butter, £1 ; second, 10s ; three entries. First prize, Mrs Benbow; second ditto, Mrs Budd. Timaru Herald, 25 Apr 1876: TEMUKA AND GERALDINE A & P SHOW. Dairy Produce: One of the, principal features of the dairy produce show was the butter. Mrs Benbow took the first prize with a sample that could hardly be beaten. Mrs Benbow carried off this palm for ham, her exhibit having an excellent flavour. Mr Wadsworth's ham that took second prize, was good, but it was not up to Mrs Benbow's. The opinion was generally expressed that it would be difficult to get English hams and bacon to surpass those at the show yesterday. Timaru Herald, 22 Mar 1877: TEMUKA AND GERALDINE A & P SHOW: In class 2, for the best side of New Zealand cured bacon, the first prize was awarded to Mrs Benbow. The same exhibitor also secured first prize for the best two New Zealand cured hams. Timaru Herald 28 Apr 1878 Auctioneers. JONAS AND HART. PRELIMINARY NOTICE. 100 HEAD DAIRY AND STORE CATTLE. 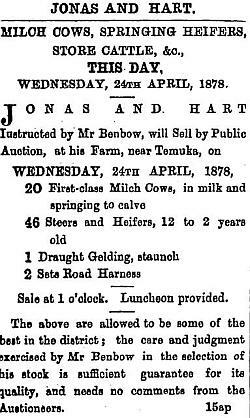 JONAS AND HART Instructed by Mr Benbow, will Sell by Public Auction, at his Farm, near Temuka, — 100 Head Dairy and Store Cattle. Full Particulars, and date of sale, in future advertisement. William ensures he has the finances ready in the bank for his next move - building a substantial building to replace his sod home. Timaru Herald, 6 Jul 1878, ROAD BOARD: It was agreed to cut the Creek straight at Langridge's bridge provided Mr Benbow permitted the cutting for about 30ft through his land, The Clerk was instructed to write asking permission to Mr Benbow. Timaru Herald, 9 June 1882: Geraldine Beagles - Hares - chase across Mr Benbows land. Timaru Herald, 30 Oct 1882: On account of Mr Win. 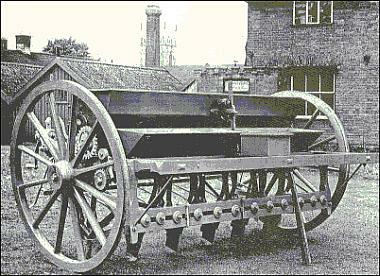 Benbow, 1 8-Horse Engine and Combine and Elevators, by Robey, in good working order. Sale at 1 o'clock. K. F. GRAY, 10-27 2927 Auctioneer. Morrison & J Dunlop GERALDINE. Timaru Herald, 7 Oct 1882: Church of England Parish, TEMUKA. A special meeting of the parishioners of this parish was held in St. Saviour's Church, Temuka, on Tuesday evening, 3rd inst. The weather was very unfavourable, and the attendance was small. The Incumbent occupied the chair, and announced that he had appointed Mr S. D. Barker as Minister's Warden in place of Mr A. Col, who had resigned on his leaving the district. The meeting then proceeded to elect Vestrymen to fill vacancies which had occurred through resignations, with the result that Mr Richard Austin and Mr William Smith were elected unanimously. The Chairman spoke of the great loss sustained by the parish and himself personally through being deprived of the services of Mr Cox as Lay-reader and Churchwarden. Mr Benbow proposed, and Mr Lee seconded — " That the parishioners desire to record their sense of loss the parish has sustained through the departure of Mr Alfred Cox from the district, and to express their heartfelt thanks for the very many services he has so cheerfully rendered as Lay •reader and Churchwarden, and in various other ways in connection with the church." Timaru Herald, 19 May 1886: ST. SAVIOUR'S, TEMUKA. The first meeting of the newly-appointed Vestry of St. Saviour's Church was held on Monday evening. There was a good attendance, Messrs Finckney and Bayner (churchwardens), Benbow, Davy, Eckford, Gaze, Langridge, Lee, Pilbrow and Talbot (vestrymen) being present. 1891 Timaru Herald, 18 Dec 1891: ANNIVERSARY DAY. Anniversary Day at Temuka was spent in the usual manner. There were a number of picnics to the beach and neighbouring bushes, and the Sunday Schools kept up their treats. The children of St. Saviour's School assembled at about 9 o'clock at the new school, and proceeded in wagons to " Hunnington," kindly placed at their disposal by Mr DeRenzy, where they spent a very pleasant day. The wagons were kindly lent by Messrs Aspinall, W. Hopkinson, and Benbow. The Rev. T. A. Hamilton and Mr Robert Pinckney, the superintendent, were in charge, and to their energy and zeal is mainly due the success of the gathering. Timaru Herald, 14 June 1895:AUCTIONEERS Canterbury Farmers' Association TATTERSALL'S SOUTH CANTERBURY HORSE MARKET. 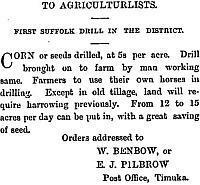 SATURDAY, 15th JUNE, 1895.On account Messrs Benbow and Moffat (Ashburton) — 6 Draught Mares & Geldings (any trial). Timaru Herald, 5 Sep 1895: Temuka Road Board - The following tenders were opened : — Contract 27— Forming 67± chains of road on the Orari plains :— J. Hams, £48 ; D. Duggan, £47 : J. Davis, £30 10s (accepted). Contract 28 — Deepening drain on Rolleston's road :— H. Hailes, £9 ; Hamilton and Morgan, £22 ; J. Roddick, £22 7s ; W. Benbow, £9 10s (accepted) ; Hans Cain, £11 11s ; J. Simpson, £11. After passing accounts to the amount of £95 9s 8d the meeting terminated. 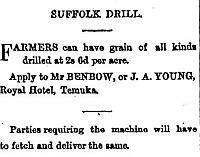 Timaru Herald, 20 July 1897: THE TEMUKA PIONEERS. A meeting of the Temuka Pioneers' Memorial Committee was held at the Town Board Office, Temuka, on Saturday evening.' Present ; Messrs. Jas ; Blyth (in the chair), P. Coira, W. Benbow, G. Levens, F Oliver, H. Goodeve, A. Clyne, E. Pilbrow (hon. treasurer), and A. W. Gaze (hon. secretary). Timaru Herald, 20 Dec 1897: TEMUKA PIONEERS MEMORIAL. 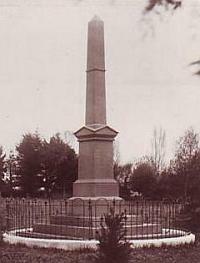 The memorial obelisk erected in Victoria Park, Temuka, by the "old identities" of the district to commemorate the Queen's Diamond Jubilee and the early settlers, was unveiled on Thursday afternoon by Mrs James Blyth, the second oldest lady resident, Mrs Hornbrook, her one predecessor as a pioneer, having laid the foundation stone. There was not a large attendance at the ceremony. 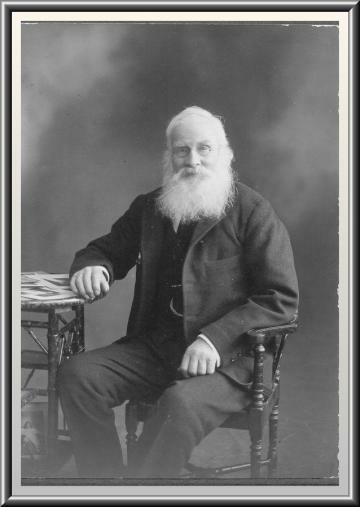 In the absence of Mr James Blyth, who was too ill to be present, Mr P. Coira presided, and apologised for the absence of many pioneers who were away from the district. The Rev. George Barclay was the orator for the day, gave an interesting address. Mrs J Lynch unveiled the memorial, and Mr F. W. Stubbs, the oldest identity present, then gave some reminiscences of the early days of South Canterbury, and was followed by Messrs Levens and Pilbrow, and others moved various votes of thanks. The obelisk is of Timaru bluestone on three steps of the same material. It is 18 ft high, and was designed by Mr James Turnbull, architect, and worked and erected by Mr W. H. Gain. On one of the basal stones is an inscription : — " Erected by the pioneers interested in the Temuka district prior to the flood of 1868, in commemoration of the 60th year of the reign of Her Most Gracious Majesty, Queen Victoria, June 22nd, 1897." At a lower level appear the names of the committee, and on three sides of the obelisk are inscribed the names of the pioneers whose names were sent in, with the dates of their arrival, as follows, a record which will become more and more interesting as the years roll by :- 1863— J. Benbow, W. Benbow, A. J Grant, T. Hobson, J. Maze, I. L. Morris, R. Thew, R. Turnbull.